When trying to find a dog a new home, one of the biggest challenges is getting them the right visibility. This page offers you options to promote a dog and get them the visibility they need to find their forever home. All proceeds go toward helping homeless dogs in the community. If you have any questions, don’t hesitate to ask. We will work with you to make sure you are happy with the text/images/video chosen for your post. Facebook – We post your dog to our Facebook page that currently has over 24,000 page likes and growing. Through boosting and sharing, this post has the potential of reaching over 100,000 people. 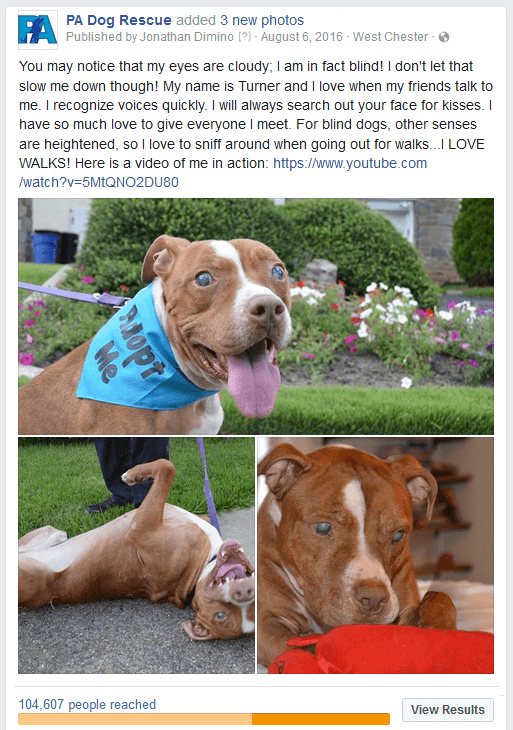 Images – We have a lot of experience posting dogs to social media platforms. As a result, we know what types of images will increase the chances of a person sharing the post. The more people that share the post, the better chance your dog has of finding a home. We will sort through your pictures and help you decide which ones to use. Need help taking high quality pictures? See Option 2 below. Facebook – Option 2 includes the Facebook post as specified in Option 1 in addition to the below services. Images – No one knows how adorable your dog truly is without good pictures. If you need assistance with pictures, someone from PA Dog Rescue will drive to your house and spend an hour or two taking pictures of your dog. Video – In addition to pictures, we will compile a promotional video that will boost your dog’s chances of being adopted. An example video can be found below. If you are interested in signing up or receiving more information about this service, please use our contact form below and we will get back to you within 3 business days. *Option 2: An additional charge of 50 cents a mile will be charged from Downingtown, PA to your location. Only locations within 2 hours of Downingtown qualify.